Jacques Becker’s masterpiece Le Trou a.k.a. The Hole is one of cinema’s greatest prison films. Becker retells this real-life story with uncompromising realism, forcing us to share in the protagonists’ physical and mental anguish. 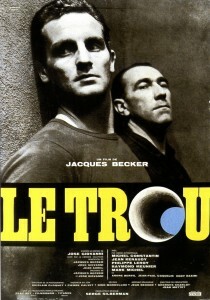 Le Trou’s gritty edge is further accentuated by Becker’s decision to use non-professional actors. Such is the conviction that the actors bring to their performances that Becker makes us see beyond our pre-conceptions and to judge his characters according to their moral strength rather than the labels pinned on them by society.